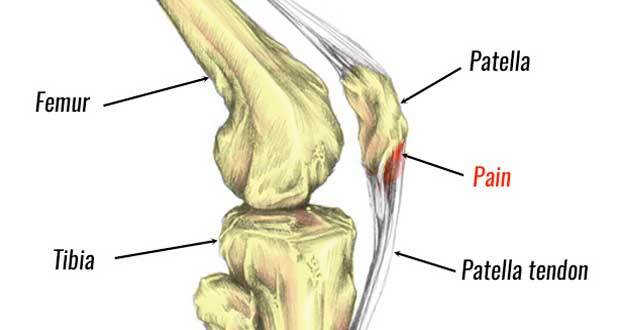 Jumper’s knee is also known as patellar tendonitis or patella tendinopathy. It causes pain at the front of the knee, specifically at the bottom of the kneecap (patella). Patellar tendonitis can be a tricky condition to treat and requires a substantial period of rest and a thorough treatment and rehabilitation program. If you do not look after this injury then you may end up needing surgery. 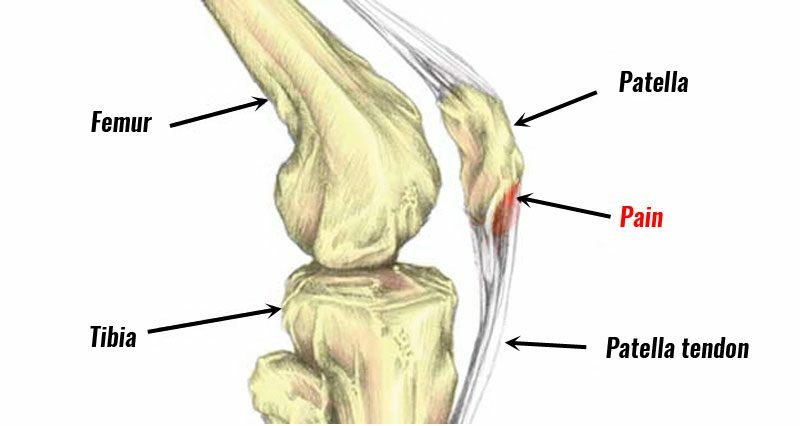 The main symptom of Jumpers knee is pain at the bottom of the patella (kneecap). Pain usually occurs gradually with the patient unable to pinpoint an exact time of injury. However, at times pain can flare up and be acutely painful. The bottom of the patella will be very tender when pressing in and may appear larger or thicker than the uninjured side. The patient is likely to experience aching and stiffness after exercise and pain when contracting the quadriceps muscles in acute cases. In particular, jumping activities are likely to cause most pain or discomfort, hence the term Jumper’s knee. How bad is my Jumper’s Knee? Jumper’s knee injuries are graded from 1 to 4 depending on how bad your pain is. 1: Pain only after training. 2: Pain before and after training but pain eases once warmed-up. Other signs will include a thickening of the affected tendon which may also have redness over the area. It is likely that an athlete with patella tendonitis will have a weak vastus medialis oblique (VMO) muscle on the inside of the thigh as well as significant weakness in the calf muscles. VMO is important in keeping the kneecap tracking correctly which in turn effects the direction of the forces through the patella tendon. The VISA pain questionnaire is excellent for monitoring symptoms which can often be difficult to describe or measure with a long-term chronic condition. The lower your score, the worse your injury. Do this regularly, for example, once per week to measure progress. Warning!! – This injury may seem like a niggling injury that is not that bad. Many athletes continue to train and compete on it as it may not be a debilitating injury and recovers after a short period of rest. However, neglect jumper’s knee at your peril! If left to become chronic it can be very difficult to treat and may require surgery. As such this tendon comes under a large amount of stress especially in individuals who actively put extra strain on the knee joint such as those who regularly perform sports that involve direction changing and jumping movements. Jumper’s knee is an overuse injury. With repeated strain, micro-tears and collagen degeneration may occur in the tendon. This is known as patellar tendinopathy or Jumper’s Knee. It should be distinguished from patella tendonitis (tendinitis) as this condition indicates an acute inflammation of the tendon whereas tendinopathy is more about the degeneration of the tendon. In practice, the majority of chronic cases are more likely to be degeneration of the tendon rather than acute inflammation which should settle down after a few days rest. Although it is an overuse injury there are a number of factors which may make people more likely to suffer from this injury including poor foot biomechanics, weak quadriceps muscles, and incorrect training practices. It is likely that an athlete with patella tendonitis will have poor Vastus medialis obliquus (VMO) function. This is the muscle on the inside of the quadriceps near the knee. They may also have significant weakness in the calf muscles. Reduce initial pain and inflammation. Strengthen the tendon and muscles. Gradual return to full fitness. Apply the PRICE principles of protection, rest, ice compression and elevation. Apply cold therapy on a regular basis, especially during the first 24 to 48 hours and after any form of exercise. A cold therapy wrap or gel ice pack is ideal. If the tendon is painful then ice can be applied for 10 minutes every hour reducing the frequency as symptoms improve. Wear a knee support, or jumper’s knee strap to reduce pain and ease the strain on the tendon. A jumper’s knee strap wraps around the tendon just below the knee changing the angle of the tendon against the patella which changes the part of the tendon the forces are transmitted. A simple patella taping technique can also relieve the strain on the tendon in the same way. As pain allows begin regular stretching exercises and eventually eccentric strengthening exercises. These focus on the downwards part of the squat exercise, so going up with both legs then slowly down with one leg is one way of performing eccentric knee exercises. What can a medical professional do? A doctor may prescribe anti-inflammatory medication e.g. ibuprofen. Do not take ibuprofen if you have asthma and check with a doctor before taking any medication. It is thought that anti-inflammatory medication may help in the short term with acute inflammation and pain but may even hinder healing later on. A professional therapist may use electrotherapy in the form of ultrasound or laser treatment to reduce pain and inflammation and aid the healing process. Cross friction massage to the tendon may also be beneficial, particularly for more chronic cases. They can also advise on a full rehabilitation program consisting of eccentric strengthening exercises. Aprotinin injections may help tendinopathies by restoring enzyme balance in the tendon. If the knee does not respond to conservative treatment, surgery may be required. Expert interviews – Sports Physiotherapist Neal Reynolds explains how a professional would treat jumper’s knee as well as expected recovery times. Stretching exercises for the quadriceps muscles at the front of the thigh should be done regularly. This will lengthen the muscles and place less stress on the tendon. Hold stretches for 10 seconds in the acute stage and up to 30 seconds later in the rehabilitation program. Massage may help loosen thigh muscles and increase the effectiveness of stretching exercises. Read more on stretching exercises for jumper’s knee. Eccentric strengthening exercises are the most important and thought to stimulate healing. Drop down slowly into a squad, or single leg squat. Then push up more quickly, using the good leg to help. Read more about strengthening exercises for jumper’s knee. Orthopedic surgeon Richard Villar talks to Sportsinjuryclinic.net about surgery for jumper’s knee or patella tendonitis. The surgical procedure for treating jumpers knee can vary depending on the individual and the surgeon’s preference. The success rate of about 60-80%. You may not ever return to the level of sport you had before the operation – many do though. It could take 6 to 12 months to return to competition after surgery. Surgery may be indicated (needed) only after conservative methods have been properly tried first. There are a number of reasons why initial attempts to rehabilitate the knee are unsuccessful. These include not enough strength training or not doing the correct eccentric type exercises, doing too much too soon, failing to continue strength training after returning to normal training. Surgeons differ in their approach to this injury. In most cases, a longitudinal or transverse incision is made over the patella tendon. Abnormal tissue is then removed. Some prefer a longitudinal cut into the tendon and some prefer a transverse one. They may take out the abnormal tissue. Some will do the operation by arthroscopy (keyhole surgery) and others may prefer open surgery.